Enter in your mobile phone number or e-mail address and we will notify you when 6" Swing Arm Vertical Base is back in stock. 150mm pivoted arm extending from a solid vertically mounted base. Cast-aluminium. 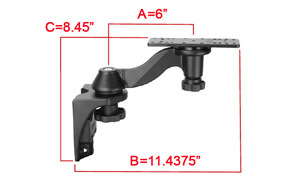 The RAM single swing arm mount consists of a 6" long BENT swing arm mounted on a vertical surface mounting base. There are two (2) pivoting points on the mount. One at the swing arm and base and one at the center of the rectangular plate and the end of the swing arm. the swing arm feels very solid and strong, well made and will last in the hard environment. i would reccomment to anyone looking for a swing arm solution that allows flexibility and sturdiness. Pros: Solid build, fits the boat gunnel perfectly, no vibration when moving. Great product, very solid unit. works well. Fantastic. Exactly what I thought it be. Sturdy. Easily manoeuvrable. View from anywhere in the boat. Highly recommend it. Yes,this is what i am after. Pros: Graet value for money.